Joining 1972-2006 AMC I6 V8 engines to GM SM465 is a viable and worthwhile option. Their power will be complimented by the strength and gearing of the Muncie 465. The parts and procedure are detailed below. This method uses a 1980-1986 AMC Jeep bellhousing that was paired with the SR4, T4 or T5 transmission. The customer will use their existing bellhousing and modify it as described below, or we can provide this item, shown for purchase below. Two kits along with multiple options below are available to meet your needs. This option is best for those who have their own bellhousing. The retainer kit and machining operations are listed as separate options. Special SM465 retainer machined from a billet steel to Late (seal style) SM420 dimensions on the transmission side and AMC bellhousing bore and sleeve dimensions on the engine side. Four 5/16-18 socket head (Allen) bolts, input seal and application specific pilot bushing are included. This option adds a machined bellhousing to the Transmission Bearing Retainer Kit above for those needing a bellhousing. If you also need a CPS, add the appropriate option on below. The kit additionally includes a machined bellhousing, clutch release arm, boot, release arm pivot, return springs, pilot bushing and bellhousing lower shield plate as well as the Transmission Bearing Retainer Kit listed above. Disc, clutch, 1980-1986 CJ; usu. 10-3/8" x 10 spline x 1-1/8"
The AMC bellhousing must be bored open to 5.000". This is very straightforward work for any machine shop. After precisely centering the bellhousing to the machine, this can be done in a classic knee mill with a boring head, or in a CNC vertical machining center using circular interpolation. 1. Modify a new or used SM465 front bearing retainer by turning it and sleeving the throwout snout. If modifying a factory SM465 retainer, it is turned down to 4.995" on its OD register. Then, a steel sleeve should be made to 1.371" ID x 1.430" OD x 2-5/8" long. This sleeve can be lightly pressed onto the nose of retainer. It is recommended that the 1.430" be turned after the sleeve has been pressed onto the retainer, as some distortion can otherwise occur.Install this modified retainer on the GM transmission using 5/16-18 x 7/8 socket head (Allen) bolts.2. The installer can buy the Novak billet style SM465 to AMC retainer (purchase below) that is ready to install and we recommend this method as the simplest and strongest result. Bellhousing machining as described above is still required.You may send your *clean* bellhousing into Novak for this entire machining service. Turnaround is typically three days and we can ship it back with any other conversion components you may need. Cost is $79. plus shipping. Contact us. 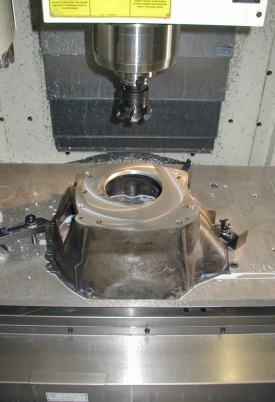 We will machine the bellhousing rear face clean and square and drill and thread the transmission holes as required. 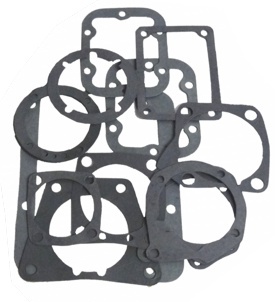 Place the engine flange of the bellhousing face down - preferably on smooth wood or the table/bed of a milling machine. Use a transfer punch to transfer the four bolt pattern of the transmission front flange onto the bellhousing rear face. If a transfer punch is not available, you may use a bolt or pin or drill to transfer the four marks onto this rear face, though this is not preferable.Align the top cover gasket surface of the transmission with the dowel pin holes in the bellhousing to make sure the trans will be level. 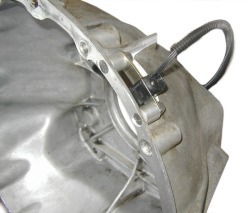 Transfer the mounting bolt hole pattern of the transmission to the bellhousing. Drill the two upper holes with a letter "U" or 23/64" size drill and tap these two holes to 7/16-14. Your 465 will have one of two types of lower bolt holes. One offers clearance for a bolt that comes through the transmission flange ear and threads into the bellhousing, as per convention. The other type of 465 is drilled and tapped for the bolt to screw into from inside the bellhousing. Either of these types will work with this procedure. If the SM465 has lower holes that are not threaded, proceed as follows: Drill the lower drivers side hole of the 465 through with a 1/2" drill. Drill the lower passenger side hole with a 27/64" drill and tap this hole 1/2-13 thread. On the lower drivers side hole, install a 7/16" bolt with the head inside the bellhousing and a nut and lockwasher at the ear of the transmission. Use a 1/2-13 bolt in the passenger side lower hole. If the 465 has lower holes that are threaded proceed as follows: Drill the lower drivers side hole through the bellhousing with a 15/32" drill. This bolt will be 7/16-14 with the head inside the housing. Drill the lower passenger side bolt with a letter U or 23/64" size drill and tap this hole 7/16-14. A 7/16-14 bolt should just pass through the lower ears on threaded type 465 transmissions. If not, a few strokes with a round file will provide clearance.While these written instructions may sound complicated, the actual procedure is really quite simple and the end result is most worthwhile. 1972-2006 AMC I6 & V8 engines, 232, 258, 4.0L, 304, 360, and 401 engines are all valid candidates. 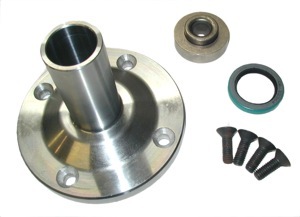 Not all AMC crank flange bores are the same. 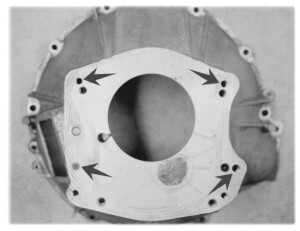 Early engines, 1971 and previous - as well as those with automatic transmissions around this era - featured a ~1.8" step (see image to the right) or a shallow recess instead of a ~1.8" centering bore as found on later AMC V8 engines. This distinction is important to make if adapting to a transmission where the pilot bushing is positioned further rearward due to a shorter input shaft length. All early and late cranks (in our documentation) feature a pilot bushing bore (the deeper bore in the crank) that is just over 1" in diameter whether they have the above step-bore, or not. On the later engines you are placing the pilot bushing where an automatic transmission would normally index the torque converter. Also be aware that on AMC engines originally equipped with a TH400 automatic transmission there may be a thin centering ring that will need to be removed to install the larger pilot bushing. If the bore measure ~1.7” instead of the expected ~1.8” you’ve got the bushing that needs to be removed. That ring 5352374 is located here. The factory flywheels on all of the above engines are acceptable. Most will accept the recommended 10-1/2” clutch. 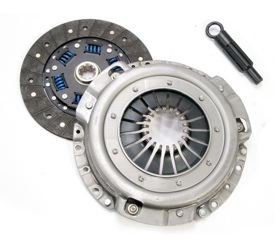 There are instances of larger clutches in some trucks. If you have one of these applications the clutch diameter will need to match. The factory pressure plates, whether three-finger or diaphragm, are compatible with this adaptation. 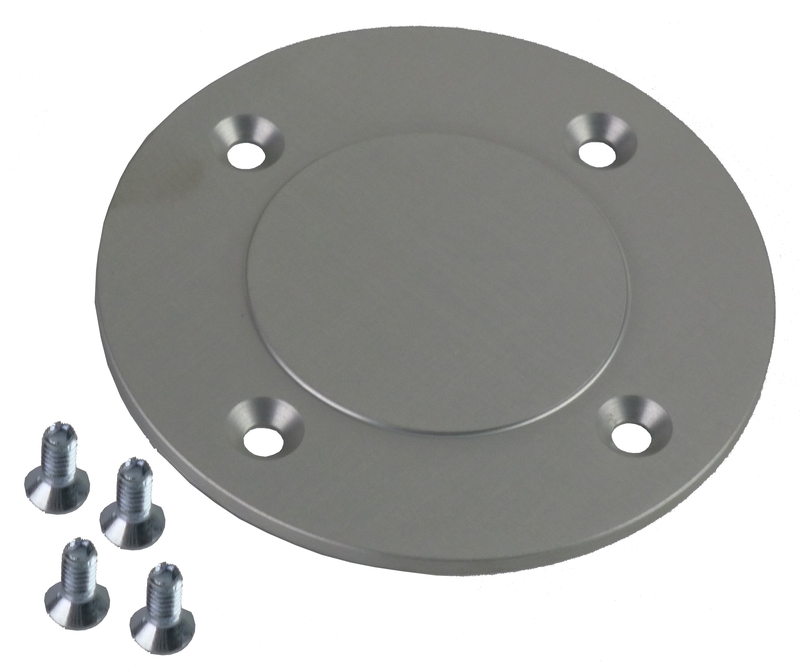 We have found that the diaphragm style pressure plate generally works better with hydraulic applications. 1976-1979 (T150 & T18) clutch disc hubs have a 1-1/16" spline diameter that is not compatible with the 1-1/8" input shafts of the SM465. The factory clutch release arms and their linkages can be retained including mechanical bellcrank style linkages. However, now is the perfect time to convert to a hydraulic clutch release system which has many advantages. Components are listed below. 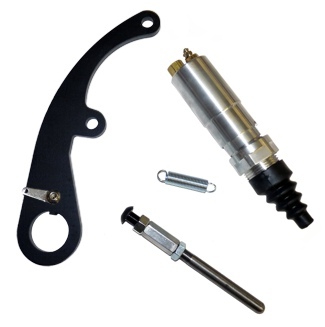 Novak’s hydraulic release slave cylinder kit. If you are looking for a granny low type truck four speed transmission, the SM465 is difficult to beat. Extremely strong, used for many years in applications from 1/2 ton trucks to 2 ton, to industrial applications, parts are readily available. All versions of the SM465 that use a standard 1-1/8” input shaft are compatible with this conversion. 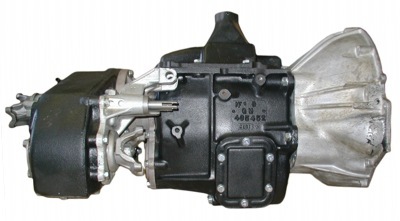 We do offer fully remanufactured SM465 transmissions with all our available updates including the countershaft spacer, TorqueLock 3rd gear, billet PTO covers, and can configure it with these parts as a package. If you want a solid SM465, this is a great option and is available below. The bellhousing will need to be machined to accept the SM465 bolt pattern and bore of the retainer kit. This option is for that service on your CLEAN or a Novak provided bellhousing. This photo illustrates a typical “early” 10 o’clock CPS installation. This includes machining a clean customer-supplied or Novak supplied I6 / V8 bellhousing to the CPS pattern selected including necessary hardware for the sensor. Sensor is not included but is available below. If you are running a stock fuel injected engine, you will need a CPS location on the bellhousing along with the correct flywheel carrying a matching reluctor. The Early position is about 10 o’clock looking from the rear of the engine and 2004-06 is about 3 o’clock. Does not apply to AMC 2.5L applications. 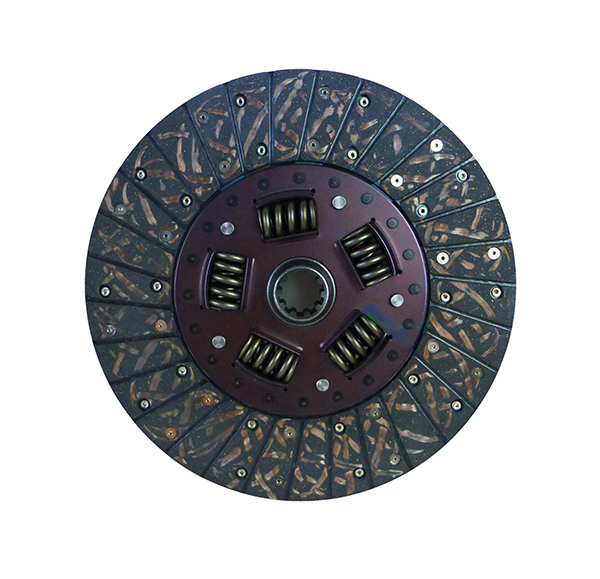 This popular clutch assembly from 1980-1986 Jeeps is our preferred kit for holding power yet with reasonable pedal pressure. The disc's spline hub features the correct 1-1/8" x 10 spline configuration for these transmissions. The disc can be purchased separately for those early applications natively using the 10 spline 1-1/16” disc. While often not needed in this application, it is priceless when clearances dictate its use. Further information is here. While sometimes not needed in this application, it is priceless when clearances dictate its use. With all the variabilities in flywheel and clutch height, do recommend its use. Further information is here. Though not required on all applications, now is an excellent opportunity to upgrade from the likely worn mechanical system. These mechanical systems are usually full of play which is aggravated by years of wear and much more affected by flex in the body/frame relationship, especially when in a twist off-road. You will find that your clutch release point will vary as things twist. With an hydraulic system, that is not the case. 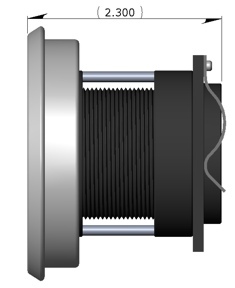 All flex is taken up by the braided stainless line which is unaffected by changes in frame to body relationship. If your Jeep has the master cylinder, that part can be reused. More information can be found here. Some would rather not have to hassle with a questionable transmission and trying to source all the necessary pieces to make a good one. 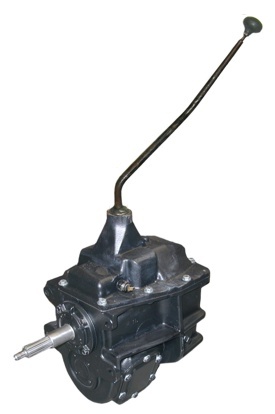 We offer expertly re-manufactured and updated complete SM420 transmissions. These will have all the available upgrades including our billet PTO covers, synchros bearings, sealing upgrades, etc. Though complete disassembly of your transmission is not required, it is our recommendation to rebuild and update a tired or unknown unit. 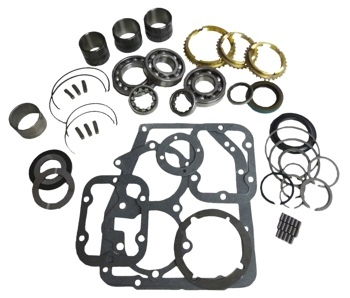 These rebuild kits offer the best available components, bearings, synchros, gaskets, and seals to perform a first rate rebuild along with your installation. Our instructions accompany all rebuild kits. At the very least, you will want the gaskets and bushing set but we do recommend the full rebuild kit. If your transmission has a tendency to jump out of 3rd gear or its history is unknown, this is the updated fix. All of our transmissions feature this upgrade. This kit contains the three press-on mainshaft bushings that are almost always destroyed when removed from the original shaft. 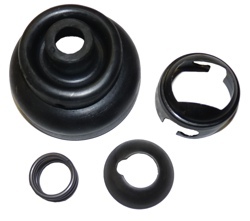 These are included in our Master Rebuild Kit, or available separately here. Straight sticks are available if yours is work or you simply want to start with a clean slate to get the bends right. 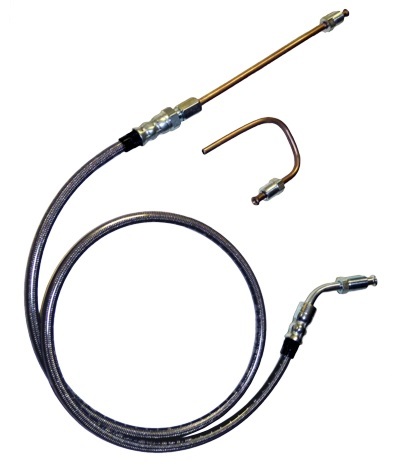 Often damaged or just needing a more rigid piece for better leak resistance, this piece will help with solving both. Why not add a little “Bling” to that transmission? These beautiful billet covers also seal up substantially better than the stock stamped steel piece. Depending on the transmission you may need 1 or 2 of them. Installation requirements will vary a great deal depending on how much of this conversion you choose to do for yourself. If all the options are purchased, typical mechanic's hand tools will generally suffice. It gets more complicated the further you choose go “go it alone”. Machining the bellhousing requires a mill, transmission rebuild necessitates pullers, a press, large snap ring pliers, etc. The installation procedure is listed below. Place the engine flange of the bellhousing face down - preferably on smooth wood or the table/bed of a milling machine. Use a transfer punch to transfer the four bolt pattern of the transmission front flange onto the bellhousing rear face. If a transfer punch is not available, you may use a bolt, pin, or drill to transfer the four marks onto this rear face, though this is not preferable. Align the top cover gasket surface of the transmission with the dowel pin holes in the bellhousing to make sure the trans will be level. 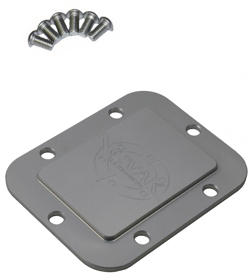 Transfer the mounting bolt hole pattern of the transmission to the bellhousing. Drill the two upper holes with a letter "U" or 23/64" size drill and tap these two holes to 7/16-14. Drill the lower driver's side hole through the bellhousing with a 17/32" drill for a 1/2" bolt clearance. This bolt will be a 1/2-13 with the head inside the housing. Note that we have used a countersunk 1/2" bolt here which offers better clearance from the rib of the clutch arm. 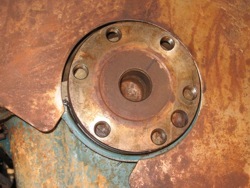 On the backside of the transmission flange ear, use a 1/2-13 nut and lock washer. Drill the lower passenger's side hole through the bellhousing with a 17/32" drill for a 1/2" bolt clearance. This bolt will be a 1/2-13 with the head inside the housing. Note that we have used a socket head cap screw (Allen) style bolt here for better bellhousing wall clearance. Blue threadlocker is recommended. Drill the lower driver's side hole through the bellhousing with a 17/32" drill for a 1/2" bolt clearance. This bolt will be a 1/2-13 with the head inside the housing. Note that we have used a countersunk 1/2" bolt here which offers better clearance from the rib of the clutch arm. Blue threadlocker is recommended. While these written instructions may sound complicated, the actual procedure is really quite simple and the end result is worthwhile. When working with the 4.0L engine, a crank position sensor is required. We can precisely install most existing sensors (from the installer's wiring harness) or a new sensor into an AMC bellhousing.